Tuesday: Grilled BBQ chicken in wraps with cheese, lettuce etc. Thursday: Omelets & turkey sausage & hash browns ! P.S. 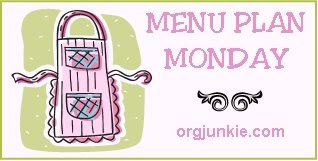 : Check out more menu planning ideas at Org Junkie's Menu Plan Monday! I do alot of potato and pasta salad(Suddendly Salad when I get great deals! )I love my potato salad recipe (and most people do too). I have them with hot dogs (turkey ones on sale at Big Y this week), keilbasa, meatball grinders, grilled chicken. Shish kebabs on the gill are fun, too.